Point level sensors, represented on the right side of the silo in the image below, are used when you need to know if the material in a vessel has reached a specific point (for example, high level, low level, or refill point). Some examples of point level devices are VRF II, Pulse Point II and Roto-Bin-Dicator. 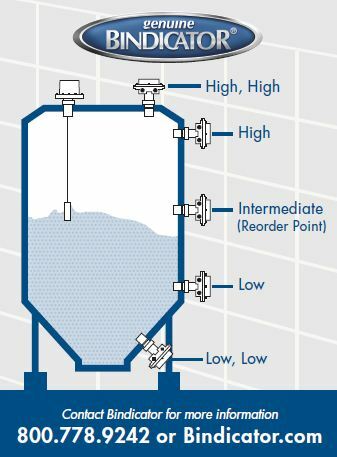 Continuous level sensors, represented on the left side of the silo in the image below, monitor the level of material continuously during the filling/emptying process. Options include devices that make contact with the material such as the GP-4 Yo-Yo™ and those that do not such as the F78MP Series air radar sensor or an ultrasonic device. If the vessel is center filled, has center discharge or is a round silo, the level indicator should be located 1/6th of the diameter from the side wall. If the fill is off center, the mounting location should once again be 1/6th of the diameter from the side wall, but it should also be installed at a 90° angle to the fill stream. The intermediate mounting location is also known as the reorder point. This location is practical when the material must be kept a certain level. Low level mounting locations typically trigger the need for filling and prevent process or production shutdown. If you have any questions concerning level sensor mounting locations please call 800.778.9242 to speak with customer support or email info@bindicator.com. Next month we will dive into the specifics of point level technology. Stay tuned!